Sheikh Mohammed bin Abdulrahman Al-Thani, Deputy Prime Minister and Minister of Foreign Affairs affirmed that Qatar and Germany have agreed that the political solution is the best solution for the Libyan issue away from the military solution, expressing the hope that wisdom will prevail to end the Gulf crisis. He said in a joint press conference in Berlin with Heiko Maas, Minister of Foreign Affairs of the Federal Republic of Germany , that their talks, which he described as fruitful and constructive, dealt with bilateral relations, economic cooperation, the Gulf crisis, the Palestinian issue, the situation in Libya and a number of regional and international issues of common concern. He added that the meeting was part of the continuous cooperation and close relations between the State of Qatar and the Federal Republic of Germany for more than four decades, adding that talks touched on the follow-up to the visit of Amir of State of Qatar, Sheikh Tamim bin Hamad Al-Thani to Germany in the autumn of last year. 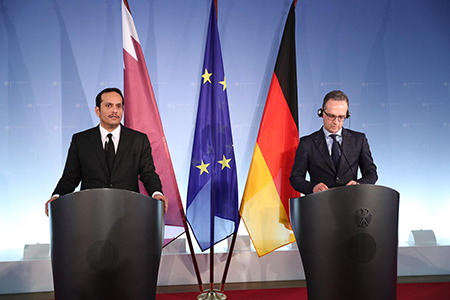 He pointed out that Qatar and Germany have an important economic partnership, referring to the Qatari investments in Germany, and praising the role of German companies in the Qatari economy, while expressing hope for the development and deepening of economic relations between the two countries. Qatar Foreign Minister expressed hope that an atmosphere of wisdom would prevail to put an end to the Gulf crisis and affirms the support of the State of Qatar for Kuwaiti mediation efforts led by Amir of Kuwait Sheikh Sabah Al Ahmad Al Jaber Al Sabah. He reiterated Qatar’s openness to unconditional dialogue, which must be in accordance with international law and does not violate the sovereignty of any country and not at the expense of the dignity of any country, adding that who paid the price are our dispersed peoples. He stressed that Qatar remain hopeful that there will be a strong GCC council in the future, but there must be honest intentions ahead of any solution. On the situation in Libya, top diplomat of Qatar stressed that the meeting discussed the situation in Libya and the escalation carried out by Haftar forces to try to impose a new political reality through military actions and the role of Germany through its presidency of the UN Security Council in stopping the military escalation in Libya and to return to the political track. He also stressed that Qatar and Germany agreed that the political solution is the best solution to the Libyan issue away from the military solution, adding that the Government of National Accord is the legitimate government that resulted from the resolutions of international legitimacy. Sheikh Mohammed bin Abdulrahman Al-Thani called on all countries not to use double standards in dealing with troops at the expense of legitimacy, and urged countries that try to play a role in Libya to play a positive role.